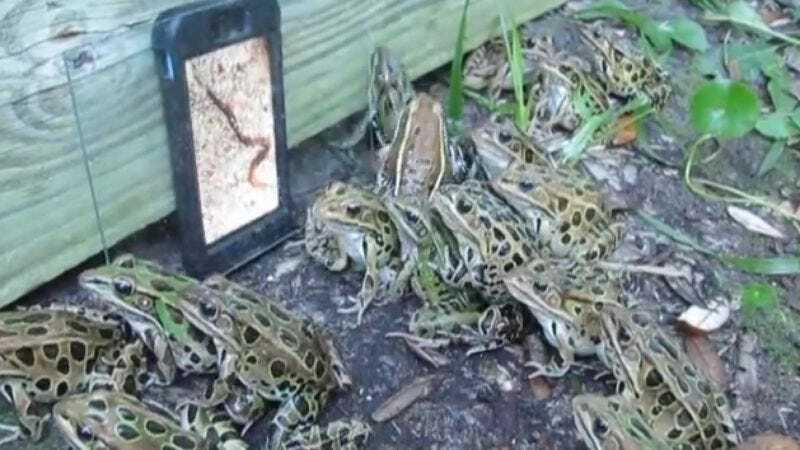 A person recently played footage of wriggling worms for an assembled group of frogs, accidentally (?) creating a metaphor for all online media. What you see above is essentially frog Facebook, and the frogs have been presented with a new video in their feed. Said video promises more (a delicious meal of worms) than it can possibly deliver, and you get the feeling that the frogs sort of know that, but they go ahead and click on it—i.e., hurl themselves at it—anyway. They can’t help themselves. Some of the frogs click on the video and hop away, disappointed. But other frogs stay and watch. (These frogs are known as “influencers.”) They stick around because hey, it’s still moving images of worms, and there aren’t any actual worms around. So even if they can’t eat the worms, they can look at the worms and laugh at how dumb worms are, employing frog ironic distance (“user engagement”). From there, naturally, cat watches dog. And person watches cat, as we all know. After that, it’s turtles all the way down. Now you understand how the Internet works.